Dark green needles have silver blue stripes. Pyramidal when young, flat topped in maturity. 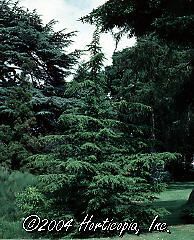 Most cold hardy of cedars. Full sun, doesn't tolerate shade. Zones 5-7.